THE NEW VERSIONS OF OUR MOST POPULAR SYSTEMS ARE NOW AVAILABLE FOR YOUR ONLINE BUSINESS USAGE! 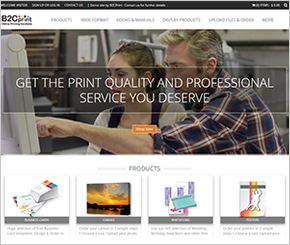 B2CPrint’s systems are currently being used by hundreds of Print Providers in 53 countries. These systems can help you streamlining jobs from both, private and business customers. Online product ordering, includes new templates, features and look, used for streamline orders from private and business customers (B2B). 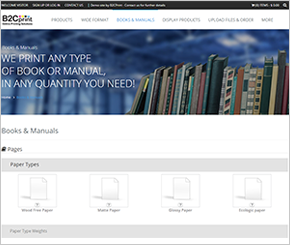 Online pricing for all type of jobs, including books and manuals printing. Customers can choose the job specifications and get an instant quote online. 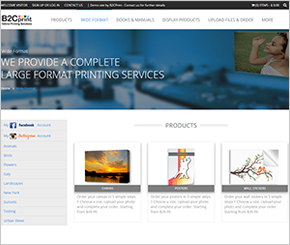 Online ordering system for wide format products, includes Canvases, Posters and Stickers. Combined with Art Galleries, Instagram integration and more. the capabilities you need to create a good online business Contact us for more details.